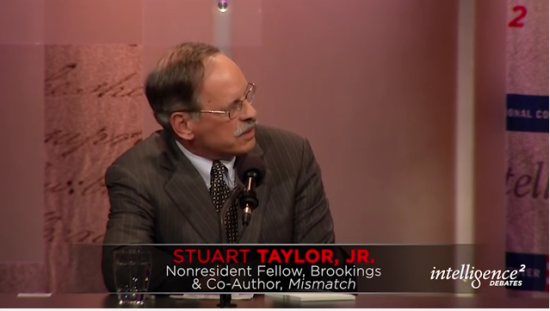 Originalism Archives - Stuart Taylor, Jr. In an Oxford-style Intelligence Squared debate held on December 3, 2015, Roger Clegg of the Center for Equal Opportunity and I argued for the proposition that “The Equal Protection Clause forbids racial preferences in state university admissions.” You can watch video of the debate at IntelligenceSquaredUs.org or via Intelligence Squared’s YouTube channel. The transcript may be read online at IntelligenceSquaredUS.org. Why Did The Supreme Court Uphold The Health Law’s Subsidies? The Supreme Court Thursday upheld a key part of the 2010 health law – tax subsidies for people who buy health insurance on marketplaces run by the federal government. KHN’s Mary Agnes Carey discusses the decision with Stuart Taylor Jr., of the Brookings Institution, and KHN’s Julie Appleby. A Nexis search finds more than 50 mentions of "kabuki"– a form of Japanese theater that has become journalese for empty, stylized ritual — in news stories about the Senate Judiciary Committee’s hearings on Judge Sonia Sotomayor. The most common explanation for why judicial confirmation hearings have become such empty rituals is that the Senate’s rejection of Judge Robert Bork in 1987 — after the conservative Reagan nominee had answered dozens of questions about his "originalist" judicial philosophy — proved that candor could be fatal for any nominee. Since the Bork nomination, "the goal for judicial nominees has been to skate through by saying as little as possible as politely as possible," the New York Times observed in an editorial Tuesday. There is much truth in this. But Bork’s fate did not prove that nominees have to hide or misrepresent their judicial philosophies in order to get confirmed. For one thing, Bork probably would have been defeated even if he had ducked the questions about his judicial philosophy, as subsequent nominees have done. For another, Sotomayor very probably would have been confirmed by a wide margin — albeit with a bit more difficulty — even if she had been far more forthcoming about her views of the law, and less determined to deny the apparent meaning of her controversial past statements. It would be improper for judicial nominees to answer senators’ questions about specific issues that might come before them, for the reasons that I discussed on this blog. But there is no ethical requirement that nominees duck general questions about judicial philosophy. And it is affirmatively unethical to give deliberately deceptive answers. Opening Argument – A Right to Keep and Bear Arms? The U.S. Court of Appeals for the District of Columbia Circuit issued the biggest gun control decision in decades on March 9, perhaps setting the stage for the biggest Supreme Court gun control decision ever. Rejecting the views of most other courts, Judge Laurence Silberman held for the 2-1 majority, "The Second Amendment protects an individual right to keep and bear arms" — not just to have guns when needed for service in now-defunct state militias. On this basis, the majority struck down the District of Columbia’s uniquely broad ban against having either a pistol or an operational rifle, even at home for self-defense against intruders. The decision, Parker v. District of Columbia, is right and should be affirmed. And contrary to a widespread myth, confirmation by the justices that Americans have an individual right to keep and bear arms would not invalidate reasonable gun control laws. To put my own biases on the table: I don’t hunt or own a gun. I support reasonable gun controls but consider the D.C. law unreasonable. I had never fired a pistol until a recent vacation trail ride, when I missed a large target with all six shots. This amused my 19-year-old daughter, who scored five out of six. Now to the Second Amendment. It states: "A well regulated Militia, being necessary to the security of a free State, the right of the people to keep and bear Arms, shall not be infringed." For decades, most courts and legal scholars have treated this as essentially a dead letter. Their reasoning goes like this: The amendment’s first clause means that its sole purpose was to guarantee each state a collective right to have self-armed private citizens available as a military force-in-waiting (militia) to fight off federal encroachments; therefore, the second clause protects no individual right; state militias long ago became defunct; so the Second Amendment is an inoperative historical anachronism. A Right to Keep and Bear Arms? The U.S. Court of Appeals for the District of Columbia Circuit issued the biggest gun control decision in decades on March 9, perhaps setting the stage for the biggest Supreme Court gun control decision ever. Rejecting the views of most other courts, Judge Laurence Silberman held for the 2-1 majority, "The Second Amendment protects an individual right to keep and bear arms"—not just to have guns when needed for service in now-defunct state militias. On this basis, the majority struck down the District of Columbia’s uniquely broad ban against having either a pistol or an operational rifle, even at home for self-defense against intruders.